Terra Forming Terra: Does Sasquatch (Yes, Bigfoot) Roam the Forests of New England? Does Sasquatch (Yes, Bigfoot) Roam the Forests of New England? Sightings in New England is not news but the scale of community response is news. This has always been about winning the PR battle to ultimately trigger expensive expeditions able to successfully photograph this creature and possibly begin a food exchange with them that brings them into close contact. It is possible with most intelligent wild animals however dangerous. Otherwise, this particular report is a actually quite odd. Assuming extensive damage includes tearing down trees, then this is quite unusual. In the meantime we do have an additional candidate in the form of the giant sloth in this part of the country that also has a putrid smell. Both are nocturnal, rely on the same niche and walk erect. The images referred to are not yet part of the public record, so it is too soon to comment anyway. A Vermont news station (WCAX.com) recently ran a story involving both Bartholomew and a witness to a Bigfoot sighting named Frank Siecienski, whose apple orchard had been ravaged by some unknown creature. Positive no deer could have wrought such destruction, he set up a trail-cam and the results were alarming to say the least as indicated below. The camera caught what is believed to be a female Sasquatch carrying her young. 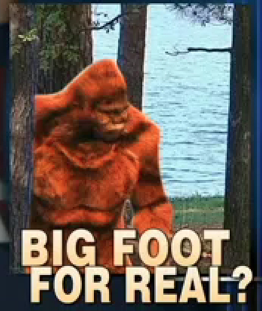 The TV network, Animal Planet, is hosting a show, Finding Bigfoot, in Rutland, Vermont. Author Bartholomew hopes the show will increase public credibility and bring Bigfoot out of the shadows of legend and folklore. For the human race, new species of animals that challenge the spirit of discovery and wonder are discovered often. Ultimately, all this publicity must be much more terrifying for an elusive creature fearing exposure to a world that may never understand or accept his existence. Check out this lengthy but very interesting video concerning current Bigfoot research.